A Missouri Park…and Missouri Style Crab Cakes? There were few things, and few places, that we were able to get all five of our children to agree on at the same time. But one spot always brought smiles to their faces and a rush to get into the car and be off on a family adventure. Maramec Spring Park is this family’s collective favorite place on the planet. Our children now live in five different states, but anytime they are home, Maramec Spring is a must visit. We go there to walk, to talk, to celebrate important family events, to feed the fish, even to get our toes freezing cold when we stick them into the cold spring water. 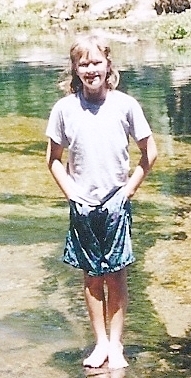 Our grandson, Jason, always enjoyed the cold water. 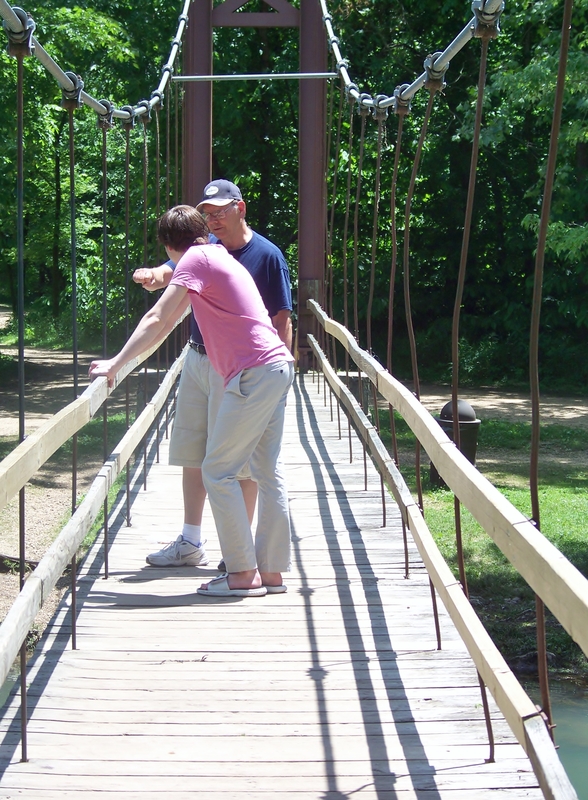 Our grandson, Harrison, stops for a chat with his Grandpa on the foot bridge. Maramec Spring is located on the Meramec (yes, they are spelled differently) River near St. James, MO. 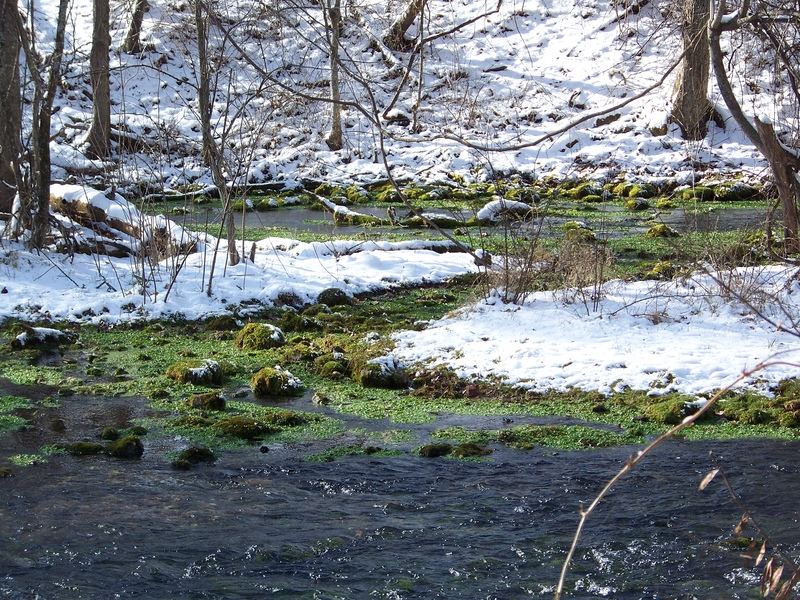 This area of the state has a karst topography, which means it has many springs and caves. 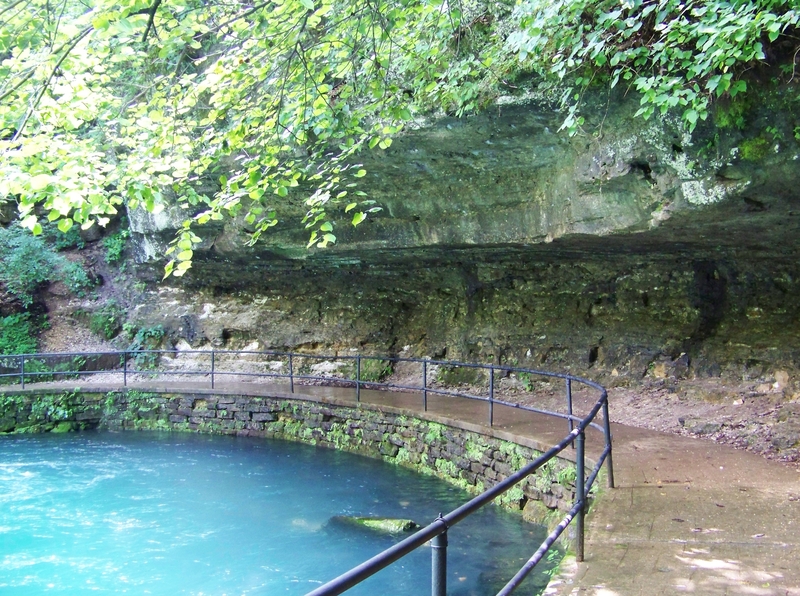 Maramec Spring is the fifth largest spring in Missouri with an average flow of 96,300,000 gallons per day. It is at this point, where the Meramec River joins the Dry Fork, that the river becomes navigable. As the river moves to join the Dry Fork, it creates a beautiful mile long run of small rapids, wading spots, and great trout fishing opportunities. There are several hiking and driving trails in the park. One of my favorite things to do is to take the walk around the spring branch of the river. Here are some of the things you can see along the way. 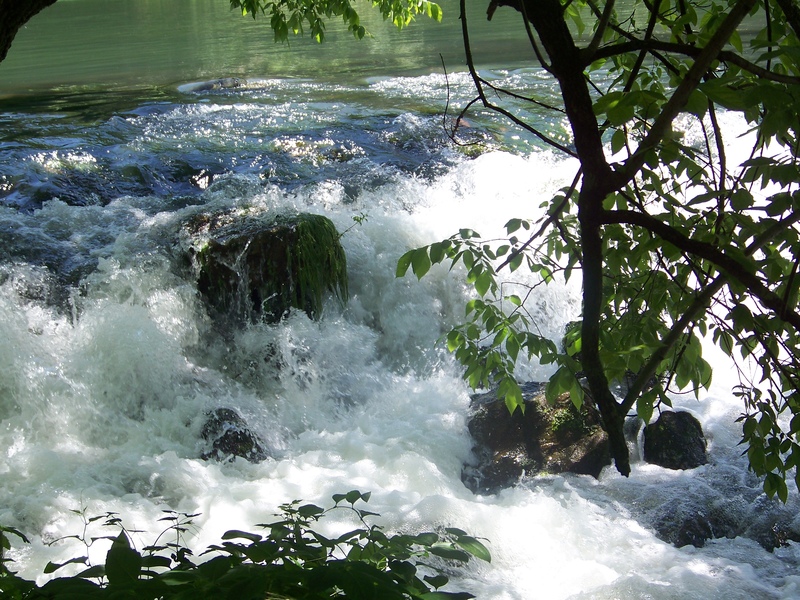 A small rapids just down from the spring. The kids love playing in this. Our niece once lost her sandal here…we never did find it! The trail stays close to the river all the way around. I love watching the water skimmers along the way. 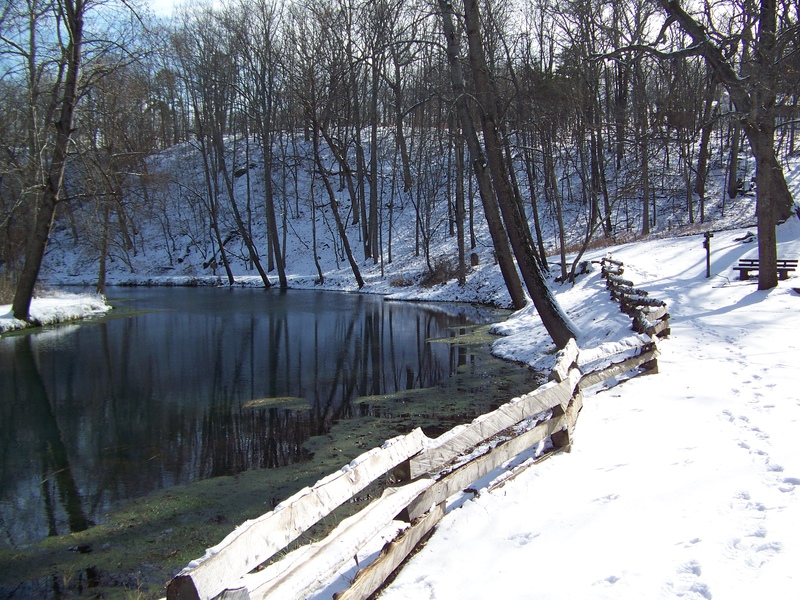 The park is beautiful year round, especially on cold and snowy days in winter. 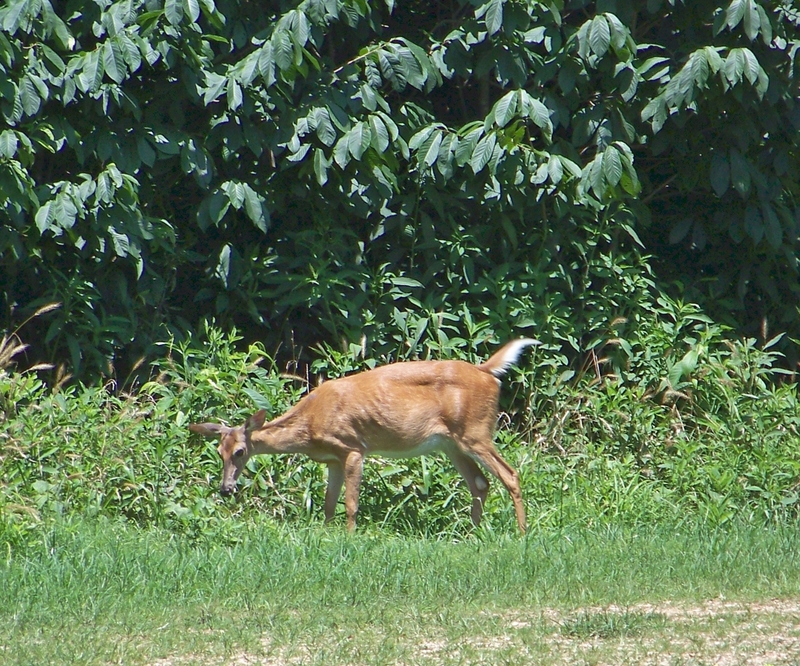 There are a lot of deer in and around the park. 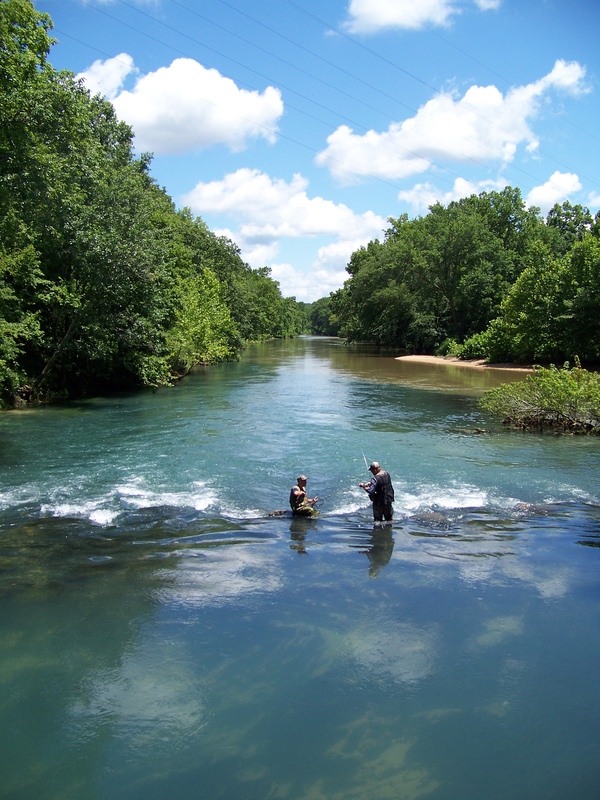 Maramec Spring Park is one of four trout parks in Missouri. It also operates a hatchery which produces 100,000 trout a year, all of which are stocked in the park. Another 40,000 trout are brought into the park from the hatchery at nearby Montauk State Park. Trout fishing begins on March 1 and continues into the fall. You can almost always see fishermen busy catching trout on the river. We think there is no better eats than fresh caught trout from one of Missouri’s fish parks. Catching trout at Maramec Spring Park. 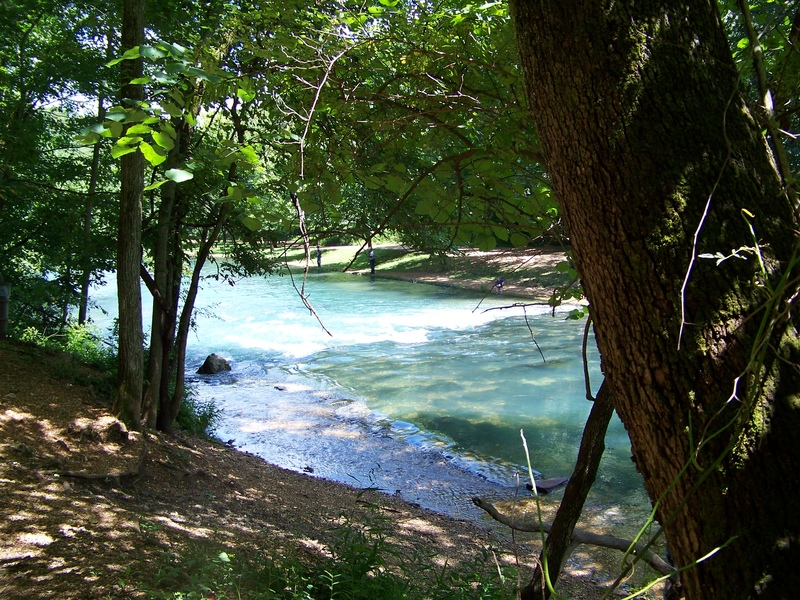 The area around Maramec Spring has historic, as well as recreational, significance. From 1827 until 1891, iron was produced at Maramec Iron Works. Thomas James was an ironmonger, who with his family, built the iron works near the spring. The water from the spring was used to power the operation. The iron works supplied iron for cannonballs and gunships during the Civil War. There are still many relics in the park which lend understanding to what a massive undertaking this was. You can still walk into some of the hematite pits which supplied the ore for the iron works, as well as view the iron work’s furnace. The park has an excellent museum that explains the process of turning ore into pig iron. Each October, the park hosts “Old Iron Works Days”. In addition to crafts and really good food, this event provides an opportunity to see what life was like in the day of the iron works. 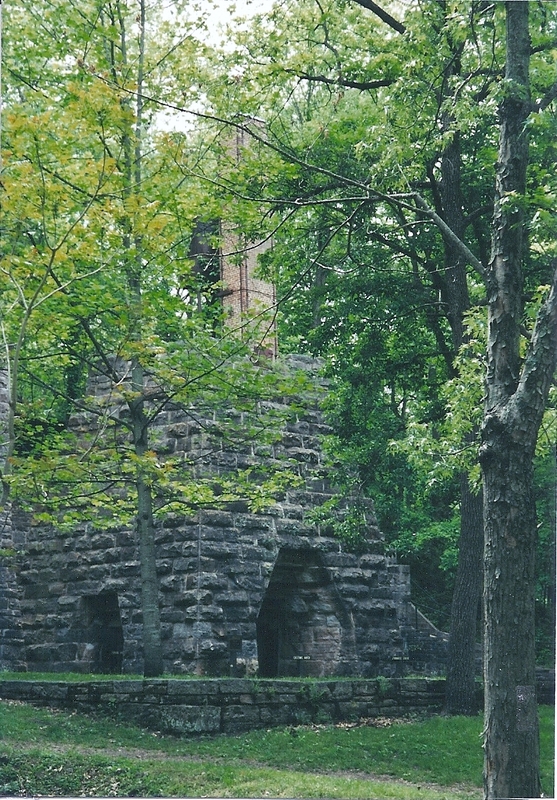 The furnace played an important role in the manufacture of iron at Maramec Iron Works. It still stands in the park today. For more information about the park and trout fishing in the river, you can go to their website at http://www.maramecspringpark.com/maramec/. Our youngest son lives in Maryland. Whenever we visit him, I must have crab cakes. But it is hard to find crab in Missouri that comes from American waters, and I do not like to purchase seafood of any kind imported from another country. 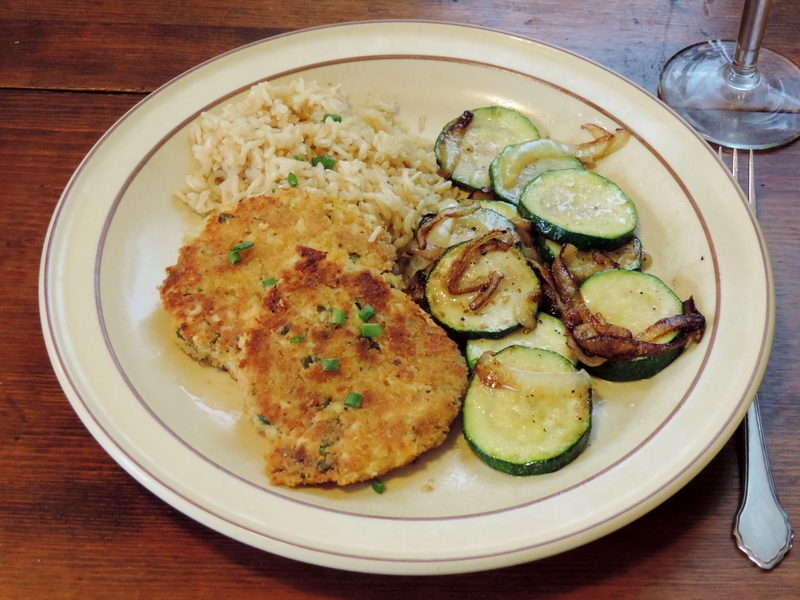 So, I was very happy to find this recipe for Missouri Style Crab Cakes. I have adapted the recipe from the original, which is from Cooking Wild in Missouri, by Bernadette Dryden. 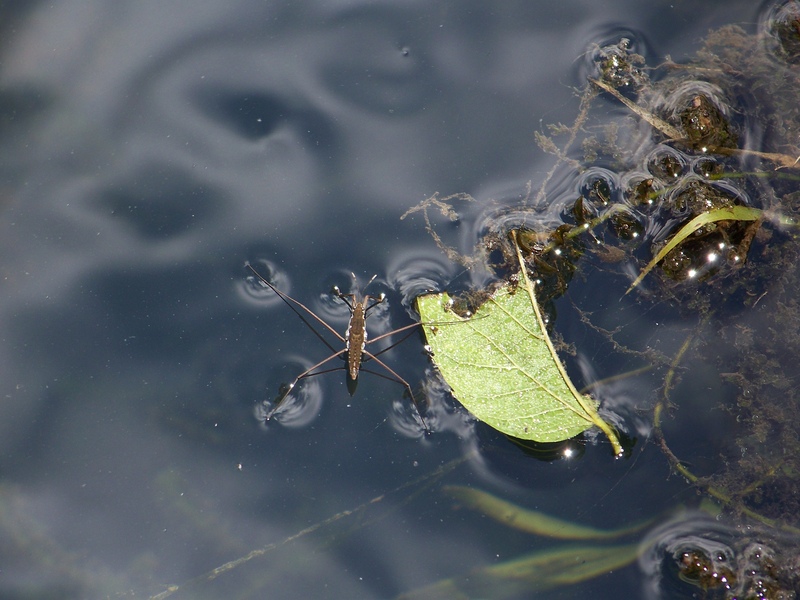 It was published in 2011, by the Missouri Department of Conservation and is available from their website, http://mdc.mo.gov/. This is a great cookbook and I highly recommend it. Combine the trout with 1/4 cup of breadcrumbs and all the ingredients through the salt and pepper. Form this moist mixture into four patties. Dip the patties into the rest of the breadcrumbs, firmly pressing the crumbs onto the patties. Fry the patties in the butter on medium heat until the bottom is golden brown. Flip the patties, and do the same on the other side. Enjoy! 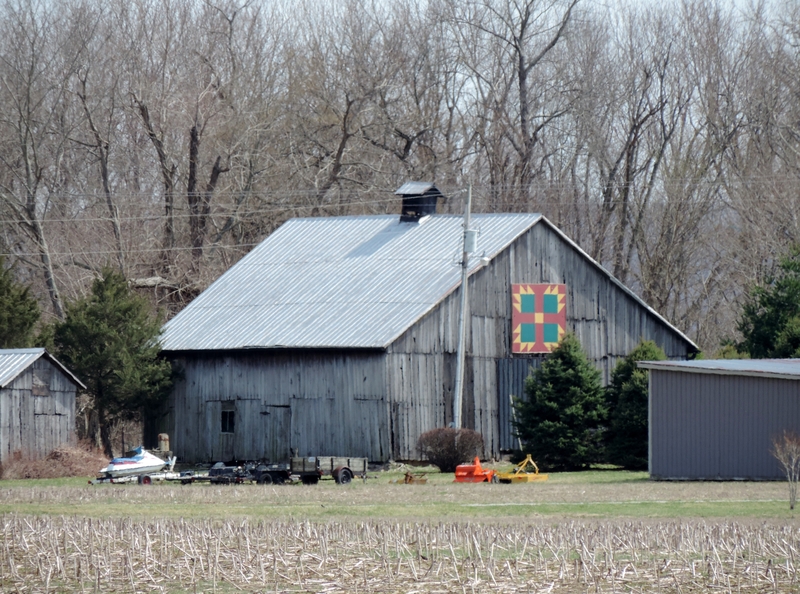 We saw barn quilts scattered across the American landscape as we traveled east. This quilt block is based on a Chinese design. I love barn quilts and as we traveled to our son’s house recently, I saw several of them along the country roads we favor when traveling. We tend to drive the state and US highways when we travel. It is less busy and gives the trip a much more leisurely feeling. Yes, it takes us longer, but that is okay. We are retired and enjoy our time on the road. I also think you can come so much closer to the real America when you stay off the interstate. This quilt design is based on a Double Aster motif. So, anyway, back to the barn quilts. They appear to be quite popular in southern Indiana, in Ohio, and in Pennsylvania. Barn quilts have enjoyed a rebirth in popularity over the last decade, but the decorating of barns has been done for over 300 years. Originally the barn decorations were folk art motifs. The introduction of paint made them easier to produce and even more popular. Painting a decoration on a barn, a barn quilt, was originally introduced in this country by German-speaking Europeans, the so-called Pennsylvania Dutch, who brought the tradition with them when they immigrated to America. By putting the painted quilt block on the side of the barn, the immigrants celebrated a tradition from the old country, as well as brightening the landscape with bright colors and bold designs. Many of the designs had special meaning to the immigrants and helped them adjust to their new homes. 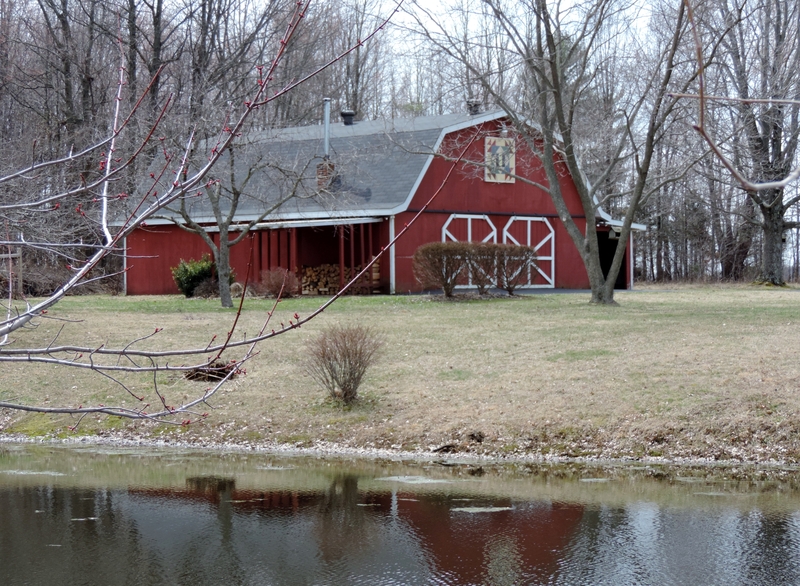 In 1989, Donna Sue Groves and her mother purchased some property which included an old tobacco barn. 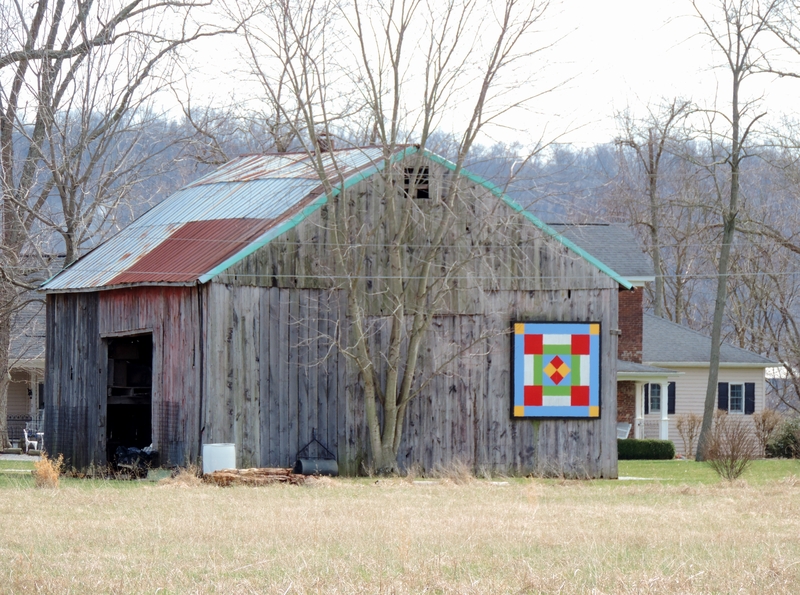 Donna Sue decided she would like to paint a barn quilt on the side of the barn, both to improve its appearance and to honor her mother’s Appalachian heritage. 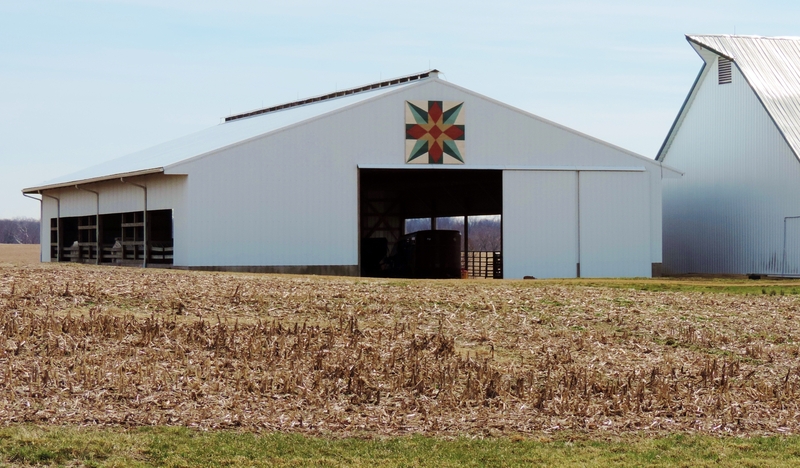 Instead of just her barn, however, she worked with her neighbors in Adams County, Ohio to create a trail of barn quilts throughout the county. 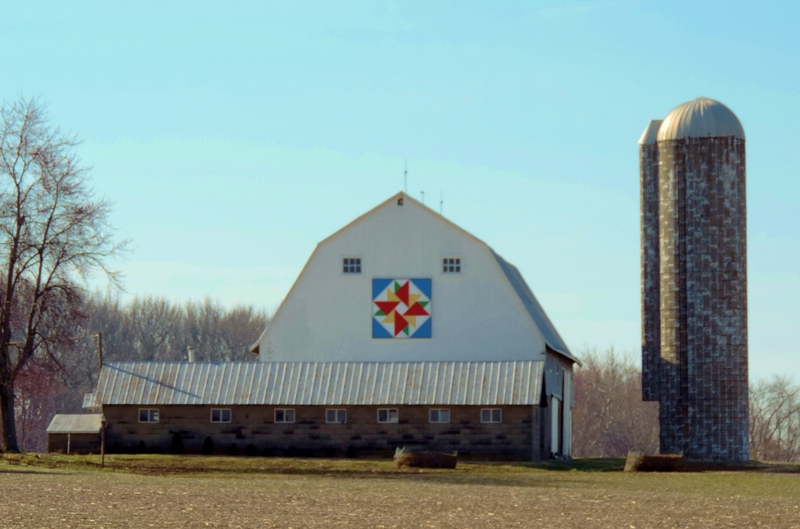 When completed, in 2001, Adams County had twenty quilt blocks on twenty barns. 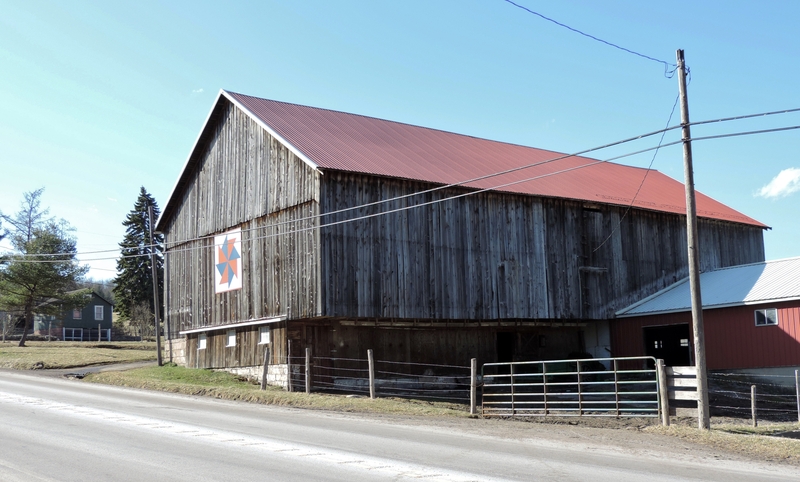 This became the first barn quilt trail in the country. Today, many quilt trails exist around the country, brightening the countryside and the spirits of many travelers. This beautiful quilt block design is based on an Ohio Star motif which forms the center of the design. In this barn quilt it is easy to see the bear claw motif. This barn quilt is a simple pinwheel. This design reminds me of a baseball diamond…I love baseball! There are few things that say comfort food as well as a good chicken pot pie made with real ingredients. 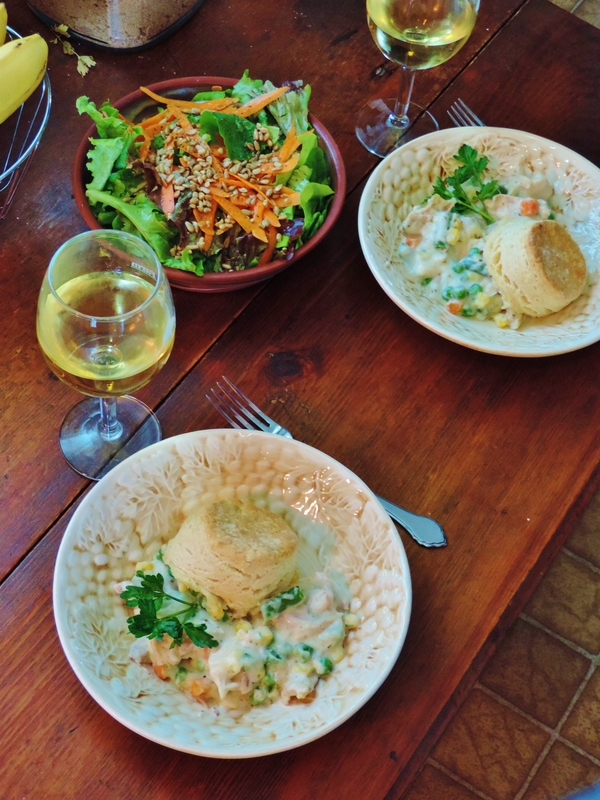 This recipe for chicken pot pie, adapted from a cookbook I found along the way entitled Southern Casseroles: Comforting Pot-Lucky Dishes, is really good. It gives you that good feeling you get when you know that everything in your meal is real food, no artificial anything. It was written by Denise Gee, and published in 2013, by Chronicle Books. The cookbook includes recipes for making several sauces that can be substituted for those “”cream of_________” soups you can find in a can. One of the sauce recipes was the inspiration for the sauce I used in my pie. Cook the frozen vegetables for half the time stated on the package. Drain well. Combine the chicken, vegetables, homemade cream of chicken sauce, and seasoning. Place in a deep dish pie plate, and set aside while you prepare the biscuits. Melt the butter over medium-low heat in a medium saucepan. Add the flour and whisk vigorously for about two minutes. You should notice that the mixture is beginning to bubble. Add the half-and-half and the chicken stock slowly, continuing to whisk until it begins to boil. Then, turn the heat to low and continue to whisk until it is a nice, thick sauce. If you go too far and the sauce gets too thick, as mine sometimes does, just add a little more chicken stock. Season with the salt, pepper, and nutmeg. Prepare your favorite biscuit recipe. You can make either roll or drop biscuits. Place the biscuits on top of the chicken and vegetable mixture. Bake in a preheated 350 degree oven for 30 minutes. I hope you will enjoy this comfort food from our southern heritage, and that you will look into the idea of making your own real food, like the “cream of _______ soup” substitutes I found reading my brand new cookbook. Enjoy! At the age of sixty-seven, my doctor tells me it is important to get daily exercise. So most days of the week, I take a two-mile walk. Some of those walks this past winter were pretty bone-chilling cold, and I was ever so grateful when my husband would have a cup of coffee waiting for me when I returned home. But walking in the spring sunshine is wonderful. It feels as good for my soul as it is good for my heart and muscles. 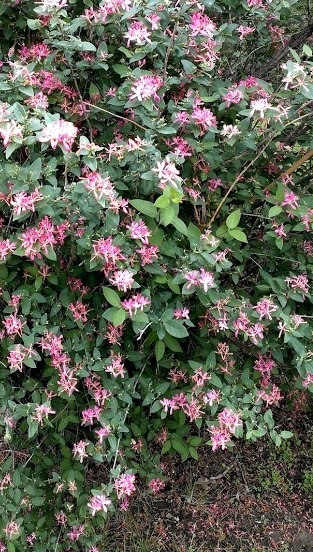 Yesterday, as I took my walk, I noticed all the spring flowers and bushes that are finally in bloom. They brought back so many memories, old pictures flashing through my mind of growing up and of raising my own children. Those pictures, those memories, were also good for the soul. I like to think they were good for the body too! 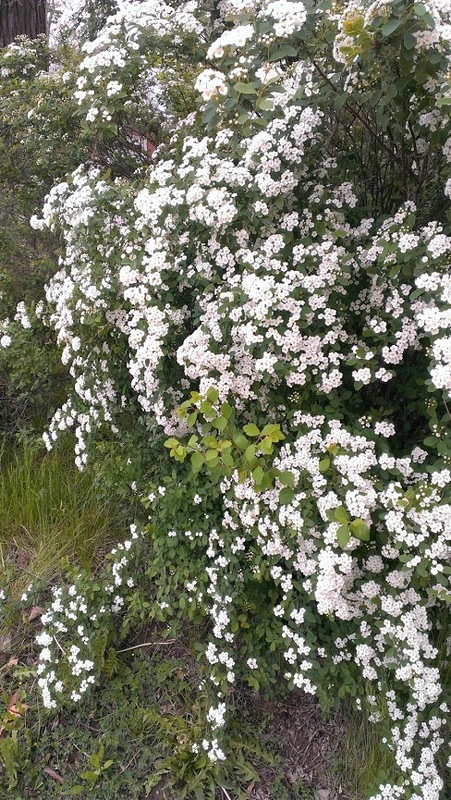 Those little white, cascading flowers…I have never known their name. They grew everywhere in Michigan when I was little. We picked them when we played outside at home and at school. We made hair rings with them, fashioned them into garlands and just picked big bouquets of them. Mom was always good about those bouquets…they always had some kind of little, creepy-crawly thing in them, but she seemed not to notice. When my own children brought me huge bouquets of these pretty little flowers, I hope they found me as grateful as she was, and as unmindful of the little things inside. Honeysuckle was always good for a snack on the way home from school with my two brothers and my sister. Now we have one in the backyard and our kids loved the sweet nectar they sucked out of the blossoms even more that I did. 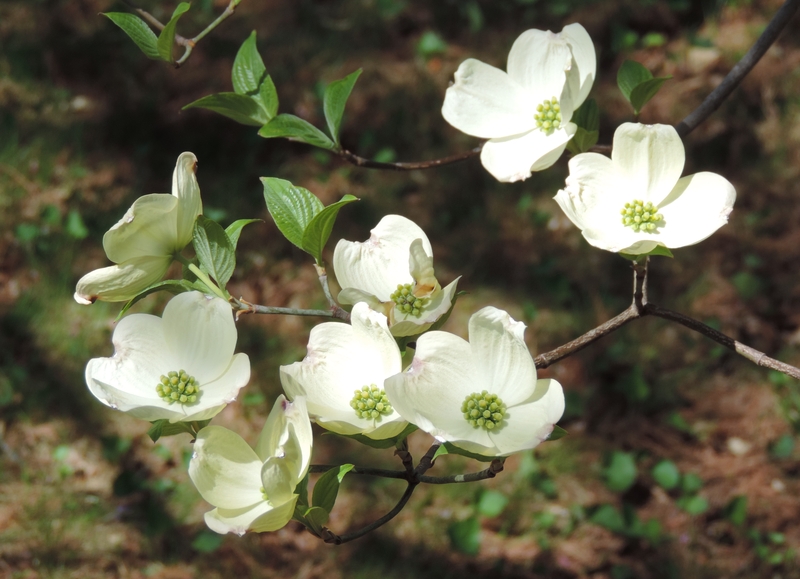 Dogwood and Redbud are trees of my parenthood. They grow wild here in Missouri, and are the reason the whole family says that almost nothing can compare to springtime in Missouri. Driving through the countryside you will see them close to the roadway. But if you look further, you will notice them bringing beautiful spring color to the woods as the other, bigger trees are still struggling to leaf out. This spring view into the woods is my favorite and gives me such hope for the warm weather and new life to come. Even along the interstates, our kids would point out these flowering trees pushing out from the stone of our Missouri hills and bluffs, giving color to the grayness of the roadway and the cut rock. When I was a little girl, my parents took us each year to pick apples. Those were such great events as the four of us kids ate almost as many apples as we picked. We would bring home bushels of apples which my parents and grandparents would then turn into many jars of applesauce and apple butter for the coming winter. We took our children apple picking too…so much fun, so many memories. My husband and I still go apple picking and now it is the grandchildren who enjoy the applesauce and the apple butter resulting from these trips to the orchard. Several years ago, our son gave us an apple tree for our yard. It never bloomed, and after three years we bought another, hoping that would help produce blooms. For two more years nothing happened. 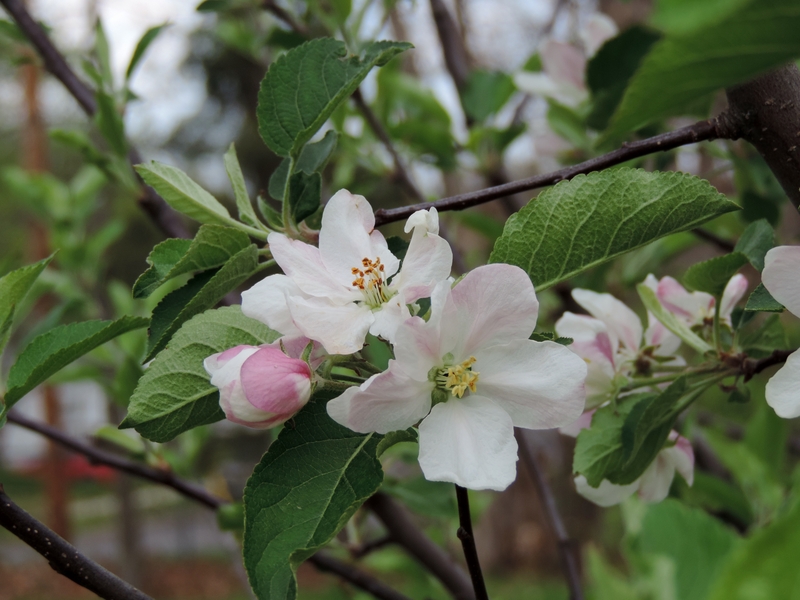 Then, last week, I noticed that the first apple tree indeed had blossoms. 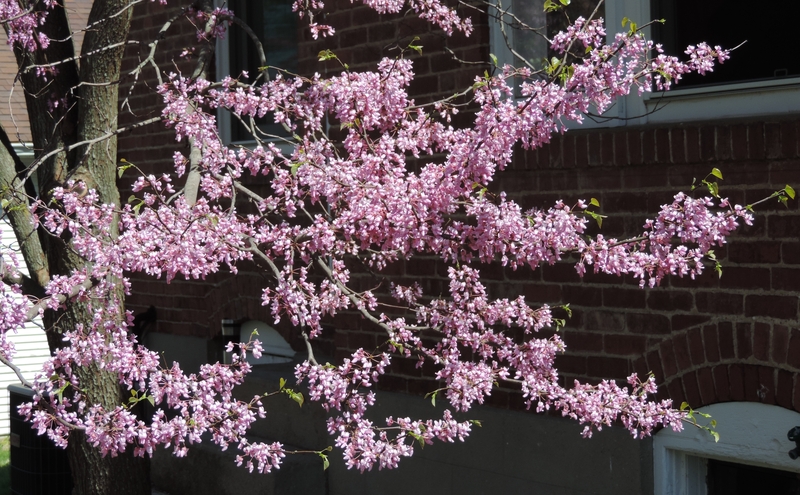 I was about as excited as I could be and immediately posted pictures of the blossoms on my Facebook page. Only the one tree bloomed, and I don’t know that we will have apples, but those blossoms are a good sign of things to come and a great reminder of things that are now past. As you take your spring walks, are you reminded of things from your childhood? Do familiar flowers and bushes bring back memories? I would love to hear about them…and if anyone knows the name of my “little white flowers”, don’t tell me! I like thinking of them as special blossoms that have no name, but have the ability to bring back great memories from a very blessed life.